I had to go up to West Palm Beach yesterday to get new tires on my car, and decided that I’d spoil myself a bit and head over to Darbster on my way back south for a little lunch. Big life changing/shaping decisions will be made this week, so I’ve been a bit stressed this weekend, so I figured a nice lunch would be a good treat. I’ve decided today to try not to stress though, because whatever happens, it will work itself out, and I’m going to try to remain open to the possibilities. Also, I’m going to hot yoga today to try to get a little more grounding! I’d always wanted to try the kale salad, so I figured this was as good of a time as any. 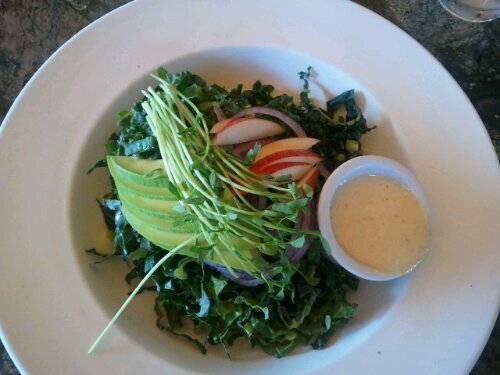 I ordered it with the raw lemon tahini dressing, which was outstanding. It had kale, sprouts, avocado, apple and red onion. I love kale! I was still a bit hungry, so I ordered the sliders to nibble on. I figured I could take whatever I didn’t finish home for a snack. These are always incredibly yummy. I ate two, and saved 1 and was VERY full!